Editor’s Note: My longtime web friend Darrin Cappe is a huge progressive rock fan and recently had the chance to sit down with the members of Marillion, one of the longest lasting prog rock bands of the past 30 years, with a devoted fan base and tons of critical acclaim. We’re very lucky that Darrin wanted to share his interview with Biff Bam Pop readers and prog fans around the world. Take it away, Darrin! Marillion – they’re not the band you think they are. You may know them for the 80’s hit song “Kayleigh”. It is a great song from a fantastic album (“Misplaced Childhood”) without a doubt, however it is just one song. Judging the merits of Marillion as a band based on that song alone is sort of like judging Pink Floyd from the song Money, or Genesis by I Can’t Dance. It in no way is reflective of what the band is about; their history or their current way of life. By being familiar with only Money or I Can’t Dance one would be deprived of a vast wealth of incredible music from both bands; from Echoes to Supper’s Ready; Dogs to The Cinema Show; Comfortably Numb to Afterglow. It is a bit of a golden albatross in that “Kayleigh” elevated the profile of the band to a level that brought them mainstream awareness, but at the same time to those who only know the one song it is how they have come to be defined. This is the truly unfortunate part, for the fans that stuck with the band after their original lead singer/lyricist ‘Fish’ left in 1988 and those who have found them along the way; a whole other world of wonders has been their reward. Steve Hogarth a.k.a. “h” entered the fold in January 1989 after the departure of Fish and a shift began in the type of music they created. What was once 70s Genesis-esque influenced progressive rock across 4 jester laden albums has developed into a fantastically diverse, lush musical landscape over their subsequent 11 CDs (from “Seasons End” through “Happiness Is The Road”). Technically Marillion are what could be referred to as Cross-Over Progressive Rock, occupying an emotional realm somewhere between Pink Floyd and Radiohead. They have produced some absolutely magnificent albums such as Brave, Afraid Of Sunlight and Marbles, as well as a treasure trove of truly phenomenal songs. In fact, like Pink Floyd and Genesis, Marillion have a wealth of epic songs lasting 10 plus minutes (Ocean Cloud, This Strange Engine, The Invisible Man, Neverland, Happiness Is The Road). They also have dozens and dozens of songs just as great as the epics such as The Great Escape, Fantastic Place, The Hollow Man, …The Space, Estonia, You’re Gone, Go!, Somewhere Else etc etc… But what makes Marillion great aren’t necessarily songs of epic length or excellent musicianship, or great songwriting alone. I feel Marillion’s true greatness has to do with connection. The music, musicianship, lyrics and delivery are all seeped in the idea of making an emotional connection – however one interprets it or feels it. While the original band had great songs with heavy, intense lyrics and dramatic music, the h era has an emotional heart that resonates within every fan. Connection is the true essence of why I believe the band has sustained such a loyal fan base over 16 albums and almost 30 years. What drew young fans to the band, the wild adolescent 80s Fish era, is not what has sustained them. What has kept people has been the fact that what they have become and the music that they write strikes a pure emotional connection with them. It could be the repetition of the line “Wide awake on the edge of the world” in Go!, or it could be how the music “evaporates” into the ether two and a half minutes into The Invisible Man It could be the searing guitar solo in Asylum Satellite #1 or it could be the word “moon” morphing into a keyboard note in The Man Of 1000 Faces that then takes off into the stratosphere. The feelings these types of moments create are pure musical bliss for Marillion fans and something that binds them together on an emotional level. On the day of their first full band show in Toronto since 1997 and only their 2nd tour of North America since then, I had the pleasure of meeting with bassist Pete Trewavas and guitarist Steve Rothery touring in advance of their 17th studio album “Sounds That Can’t Be Made” due out in September 2012. Darrin: Hi guys welcome back to Toronto. I think this is the first time you’ve been here since the This Strange Engine Tour in 97. Steve: You know I can’t remember. I know we played here for the Los Trios show but I can’t remember if we played here on the Marbles tour. D: No the only place you played in Canada for Marbles was in Montreal. I saw the Los Trios show at The Mod Club in ’05. Pete: Yeah I have very little recognition of it. S: They all begin to blur together after 30 years. Toronto has a lot of good memories for us though…. D: So you’re on the road in advance support of your 17th album Sounds That Can’t Be Made. P: We sent some to Mike yesterday through Dropbox. It’s great that the technology is there to do that. D: So you are working on the album while on the road in support of an album that isn’t out yet. P: Yeah so Sounds That Can’t Be Made is kind of an apt title in some ways. S: It is pretty full on as we travel a lot of the nights and we don’t really sleep properly but all of the shows have been amazing, but that kind of takes it out of you as well. Trying to find the time and energy and the focus to be recording stuff takes a lot of purpose to make it happen. P: That’s the thing it’s very difficult to get motivated and you’ve got to be in the right frame of mind to be enjoying what you are doing and working out how to make it better. S: In this situation the concerts take the priority but always in the back of your mind is the album as well. D: You could have dubbed it “The Album That Can’t Be Bought” Tour. S (laughing): or the “Sleep That Can’t Be Had” Tour. This is the beginning of the tour really. We’ve got most of the year touring around Europe, South America in October. P: It’s Phase One really. But from a fan reaction point of view it is just fantastic. P: I’ve had so many people that have come up to me who have said it is the best show they have been to and …. S: …You say you should get out more. P: It’s been really fantastic. I think it is better than our expectations were. Obviously our expectations are quite high. I think fan’s expectations are quite high cause we haven’t been here for so long. D: I think fans always know it is going to be great. There is always variance in any live show you see from a band but anyone who knows you guys or has seen you over the years knows it is always a great show. D: It’s a different view from our side. S: You know we are perfectionists. The reason we’re still doing it is that we have an attention to detail and a drive to make it as good as we can humanly make it. So maybe from the audience perspective it might not show but for us there are some technical gremlins or someone isn’t feeling 100%. P: Too hot.. that kind of thing…(It was 45C with humidity outside on the day of this show). D: It’s interesting though because those technical moments that you have like the recent keyboard issue in New York. M: (passing by again) Really? I never heard about that one…(Steve H’s microphone stand broke and Mark had to hold the mic for him while he sang Three Minute Boy and play keyboards at the same time). P: We’ll that’s the thing isn’t it? P: It did actually. The thing is like Steve said we are perfectionists and we like to be as professional as possible. There is a standard that we will refuse to go below. But when stuff around you is falling down you just have to sort of go with it. P (laughing): …or with everyone else’s performance. There are mind games at play. You only have to miss a note or do something where you think, “I wish I hadn’t done that” and it ruins the whole song for you. D: So you played Montreal last night. Marillion as a band seem to have a special relationship with Montreal in particular. I was there for the 2 conventions and for the 2004 show for Marbles at The Spectrum and opened with The Invisible Man, which was followed by a 10-minute ovation. S: Yeah it’s incredible for us really, it’s like a love and such a spiritual connection that the audience seems to feel for what we do…it’s probably one of the very best audiences we’ve played to. I mean we have amazing audiences all around the world. Paris sometimes is mind-blowing, or Amsterdam and Utrecht, Manchester in the northwest of England, but Montreal is definitely in the top 5 or top 3 of the audiences we play for. P: The Invisible Man is a funny song as well because it’s not a song that I think…I would think that it is quite a difficult song to listen to…to get into. But you know when we toured with Deep Purple in Germany a couple years ago we opened with Invisible Man it went down a storm. And I can’t imagine many of the Deep Purple audience knowing that song. It must do something. P: Yeah I think it is a great…I’m very proud of that song. D: It has the elements of what I think is a lot of what draws people to the band. It has such a heavy emotional connection and element that is prevalent in a lot of what you guys do that fans can relate to it in a way that … a lot of the lyrics and music have a very cinematic quality that you can immerse yourself in as a fan without necessarily knowing what it specifically might be about. And that song in particular definitely has that element. D: Do you think that the success of the conventions that you did in 2009 and 2011 led you to doing this particular tour of North America? S: No it is something we’ve been trying to do for a while. It is a nightmare to pull of logistically. Since 9/11 it is so difficult to tour. With the US you can’t even apply for a VISA. You have to apply for permission to apply for one. All these hoops you have to jump through and you have to factor in the nightmare of withholding tax and all the complications. But Lucy has worked really hard to make this happen. She deserves a load of credit. P: Fantastic fans in Canada and America and we did feel it was time cause for the last couple of tours we’ve wanted to go to America but at the end of the day it was just too difficult. The thing is it takes about a year to start the process of filing the paperwork and gathering all the information they need for them to be able to process it in time, which is just ludicrous. S: Which is why when we put this tour together the idea was the album would be finished and we’d be out promoting it, though obviously that hasn’t happened. Once it is in motion the dates are firm and you can’t really move them. D: So how in that situation with an album that isn’t out yet do you decide what to present to the audience and what might be representative of the album? S: For us it was what we felt we could do justice to given the fact that the album isn’t finished. Some of the parts and songs we’re still writing and recording. You have to base it on what is either complete or pretty complete which is why we chose “Power” and “Lucky Man”. P: They are good songs to be playing cause they play well without too much work. They’re not necessarily that representative of the album, but then it’s an album of songs. It’s not an album with any particular musical theme or feel running through it. Each song stands alone. But they are all very, very strong. They’ve all got strong melody and lyrical content. D: I know when you are working on an album you listen to it a thousand times in the process to the point that you never want to hear it again before it is even released but also there are those moments when you listen back and you go “Wow that’s awesome”. P: There’s a few songs…there’s one song “The Sky Above The Rain”…. I’ve been concentrating on some other songs and I put this on the other day and I had completely forgotten about one of the sections and it just blew me away and I was thinking “My God that is just fantastic…That is going to be SO great when we play that live”. The thing is about all of this is I think we all get kind of frustrated when you get to a place where you just want to play the album to people. You just want to play the songs to people and see what they THEY think about it, because we’ve spent so long worrying about it and trying to work out what’s good and what’s bad an what needs to change that I just want to play it to people. D: I think those are the moments where you are really proud as a musician in the creative process where you feel like Wow I’ve done something that I never would have expected which moves ME after hearing it so many times. S: Yeah. This album has been a long time coming really to come up with something that we all agree is really special. P: Because we’ve been together for so long and have worked on so much music together it does become harder to impress each other. It becomes harder to become inspired and excited about stuff. That’s why it has taken so long really. There is an integrity we want to keep. We could throw an album out in 6 months probably less if we wanted to but that’s not what we’re into doing. Every moment has to be special. D: You’ve also done a lot of side projects in that time as well. P: Sometimes it’s nice to just get away for a little bit. P: It keeps it all fresh and it is very easy if you are not careful to take for granted, what we have. Not just with the fans but what we have with ourselves as well cause we’re very lucky to be working with the five of us. Cause we do inspire each other immensely. It really surprises me every time we come to write an album how excited we still get about the music we create together which is fantastic. Be sure to check back later this week for the second part of Biff Bam Pop’s exclusive interview with Steve Rothery and Pete Trewavas from Marillion! 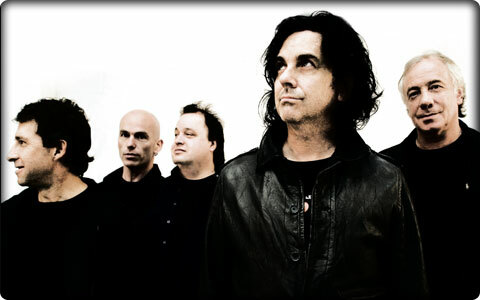 Go to http://marillion.com/music.htmto get a free 10 song Marillion sampler CD called Crash Course. Thanks to Eric Heiss for his assistance. Photo by Andy Wright of Point & Shoot Imagery (http://www.pointandshootimagery.com). Previous Post Previous post:The Amazing Spider-Man Pregame: Beware the Lizard! Great interview, even for old school fans like me. “No One Can” was my wedding song. 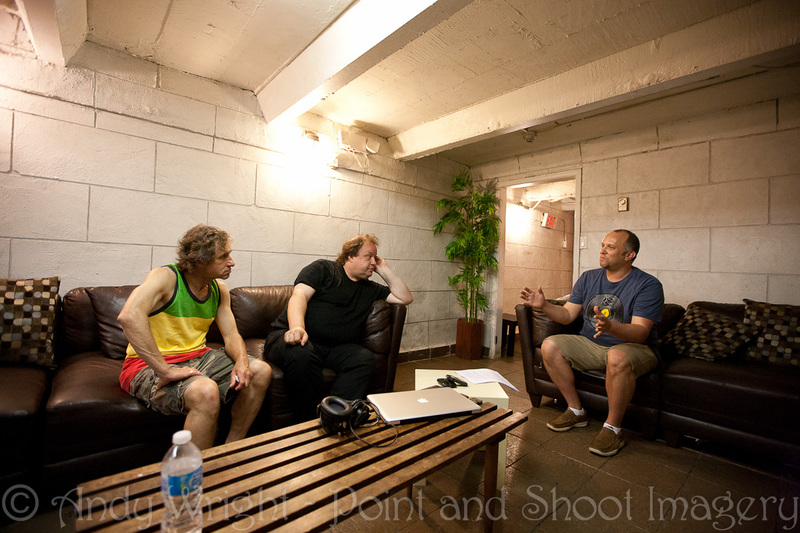 Pingback: Exclusive: The Marillion Interview With Steve Rothery and Pete Trewavas, Part 2 « Biff Bam Pop!